This component is part of Electrical Systems. The appropriate wiring diagram for the 230SL, 250SL or 280SL is included in the Owner Manual. During the years the electrical system of the car went through a number of changes. Especially the US mandated anti-pollution measures are badly documented. The Pagoda SL Group has published color coded diagrams for its members, courtesy of and copyright of Joachim Ahlert. These are accessible for Full Members here: Color Wiring Diagrams. As a courtesy we provide a high quality grayscale version of the 280 SL wiring diagram, and a copy of a 280SL US version wiring diagram, showing additional features such as the transistorised ignition and emissions control relays. 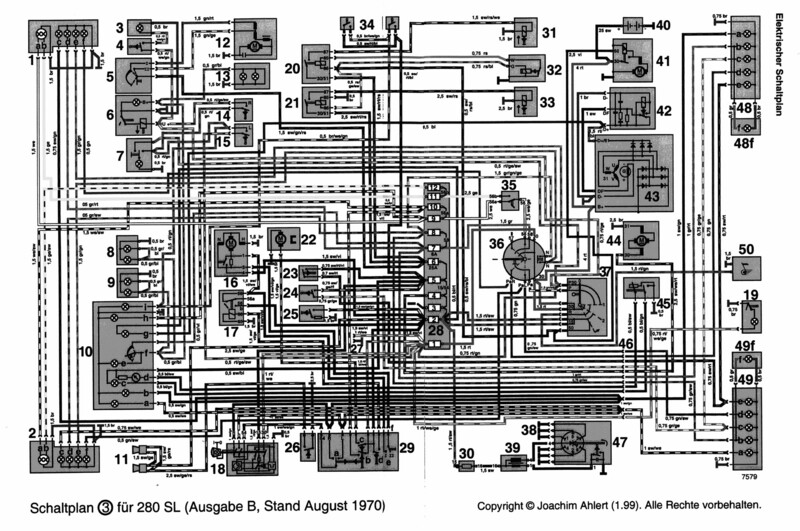 280SL Wiring Diagram Note: 584K, use your Save As function. Note: The description "Idle Increase Solenoid" for item 51 on "280SL (US Version) Wiring Diagram" is incorrect. The idle increase soleniod is uni-directional (extended when energized, spring return), whereas the solenoid on the schematic is bi-directional. What is shown appears to be the transmission solenoid which is three position with two coils, extended, mid positon, and retracted. The wiring indicates extended positon when the "venturi control switch" is closed, and retracted position when the "kick down switch" is closed, which is the function of the transmission solenoid. The "Idle Solenoid" does not appear on this schematic, nor do the forward and reverse auto-transmission pressure switches. An exceedingly useful document is enclosed as a download in the Connectors section. It lists all connectors, pinouts, and colours of the main wiring circuit. If one of your connectors has broken and you need to hook it up again, this document is essential. Example: 1,5 sw/gn/rs means: 1,5 mm2 cable diameter, black cable with green and pink marking lines.